Our recipe for lemon drizzle loaf cake is topped with pink icing, sugar rosettes and lemon zest, for a bake that is as pretty as it is delicious. This recipe for salmon and potato casserole is simple and makes a hearty, healthy meal when served with spring vegetables. It may look extravagant but our recipe for this triple-layered vanilla cake is simple. The vanilla infused sponge is slathered with vanilla buttercream icing to make the perfect spring treat. Sweetly creamy white chocolate makes an indulgent filling for this easy cheesecake recipe. Preheat the oven to 175°C/gas mark 4. Separate two of the eggs into two cups. In a large bowl, cream the butter with a pinch of salt, the vanilla extract and 250g of the sugar. Gradually stir in the egg yolks and the remaining eggs. In a separate bowl, mix the flour with the baking powder. Add this to the wet mix in batches, alternating with the gradual addition of the milk. Mix well after each addition. Place one third of the mixture into a 26cm greased springform cake tin and smooth the top. Using a hand whisk, beat the egg whites, gradually adding the remaining sugar. Loosely spread this on top of the mixture in the cake tin, to approximately 5mm from the edge. Sprinkle with the flaked almonds. Place in the oven and bake for 20-25 mins. Remove, leaving the oven on, and place on a cooling rack. Carefully ease the cake from the tin and allow to cool. Clean, dry and re-grease the tin, then add the remaining mixture and place in the oven, still at 175°C/gas mark 4. Bake for 40-45 mins. Remove and place on a cooling rack, carefully remove from the tin and allow to cool. Cut this piece of cake into two layers, slicing it horizontally through the centre. Melt the white chocolate in a basin over a pan of warm water. Place the cream cheese in a bowl and then stir the yoghurt and chocolate into the cream cheese in alternating batches, mixing well in between. Spread the bottom two layers of the cake with the marmalade, followed by the cream mixture and assemble so that the layer with the meringue is sitting on the top. Refrigerate the cake for 2 hrs before serving to allow the cream to firm slightly. You can get LandScape back issues or subscribe to LandScape. A familiar evening meal is transformed when made from scratch with fresh ingredients. This simple recipe uses ingredients that are likely to already be in the store cupboard. For the sauce: Mix together the raisins, sugar, malt vinegar, tomatoes and a pinch of salt in a large saucepan and bring to the boil. Add the water, then simmer on a low heat for 25 mins until thick and glossy. Allow to cool. For the fish fingers: Preheat the oven to 200°C/gas mark 6. In a food processor, crush the oats until approximately half their size, then place on a dinner plate. Without removing the skin, slice the haddock lengthways into strips. Place the flour on a plate, beat the eggs in a bowl and season. One at a time, coat each haddock strip in flour, then egg, and finally the crushed oats. Transfer the haddock to a baking tray lined with baking paper. Drizzle with the oil and bake for 25-30 mins until cooked through and golden. In the meantime, place the brown sauce mix in a food processor and blend until smooth. Transfer to a serving pot. 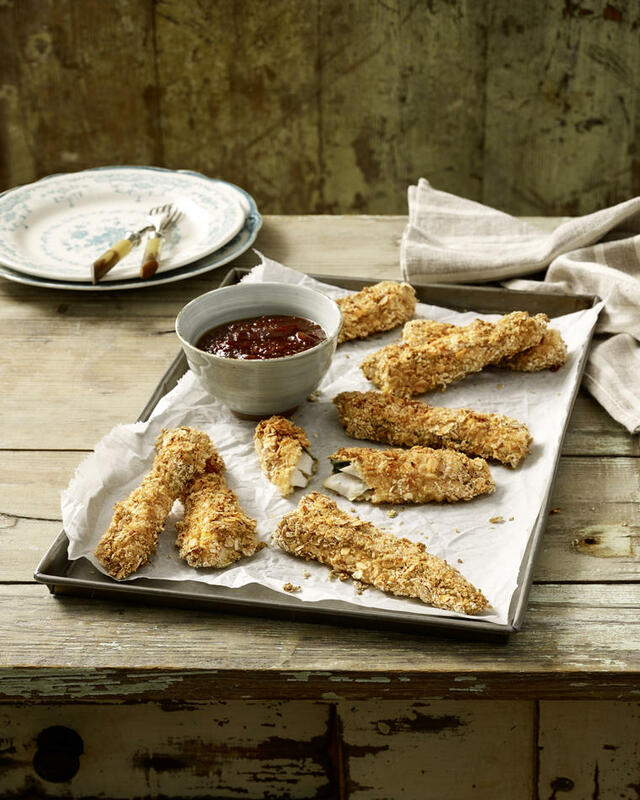 Place the fish fingers on a plate and serve with the sauce. Bacon and eggs are given a new twist in this recipe for savoury muffins, perfect for a picnic. The bacon can be replaced with sundried tomatoes or roasted mushrooms for a tasty vegetarian version. Edible violas have a sweet, fragrant taste that works perfectly with confections such as these cupcakes. This recipe requires a little extra time but the effect is delightful. To candy the flowers: Gently wash the flower petals, then pat dry with kitchen paper. Lightly whisk the egg white in a bowl until frothy. Using a clean pastry brush, paint the egg white onto both sides of the petals. Sprinkle immediately with sugar and leave to set on wire racks before using. For the cupcakes: Preheat the oven to 180°C/gas mark 4. Line a 12-hole cupcake tin with paper cupcake cases. Beat together all the cake ingredients in a large mixing bowl until smooth and creamy. Divide the batter evenly between the paper cases. Bake for 20 mins until golden and risen. Remove the cupcakes from the oven and leave on a wire rack to cool. For the cream: In a mixing bowl, whip the cream with the icing sugar and vanilla extract until semi-stiff peaks form. Transfer to a piping bag fitted with a star-shaped nozzle. Pipe swirls of cream on top of the cupcakes. Garnish each with a candied flower before serving. Add stout to cheddar for a rich warming soup, in this recipe for quick St Patrick's Day supper. Place the chopped potatoes, onion, garlic, carrot and parsnips in a large saucepan. Pour in the stout, add the leaves from the thyme sprigs and season. Bring to the boil, then simmer for 20 mins until the vegetables are soft. Blend until smooth in a food processor. Return to the heat and simmer while stirring in the water. Bring to the boil and add the Worcestershire sauce. Mix in the grated cheese until melted. Divide between bowls and top with the extra cheese and thyme. Preheat the oven to 200°C/gas mark 6. Roughly chop the rhubarb sticks into 3-4cm pieces, halving lengthways if very thick. Place the rhubarb pieces on an oven tray and sprinkle with the caster sugar. Bake for 15 mins, allow to cool and reserve any juices. Turn the oven down to 180°C/gas mark 4. In a large bowl, mix together the melted butter and brown sugar until combined. Beat the eggs and egg yolk into the mixture until smooth. Fold in the flour, a pinch of salt and two-thirds of the broken chocolate, then mix in half the cooled rhubarb. Grease and line a 24 x 24cm oven tray with baking paper. Transfer the mixture into it, spreading it out with the back of a wooden spoon to fit the tin. Scatter with the remaining chocolate and remaining baked rhubarb pieces, then drizzle over the reserved rhubarb syrup. Bake for 20 mins, then cover the tray loosely with tin foil and bake for a further 20-25 mins until slightly browned and loosely firm. Allow to cool, cut into squares and serve. Preheat the oven to 190°C/gas mark 5 and grease a large, flat baking tray. In a large mixing bowl, gently cream together the butter and icing sugar until smooth and thick. This will take approximately 5 mins. Stir the orange zest into the mixing bowl, then sift in the flour. Mix together thoroughly until a thick consistency is achieved. Transfer the mixture to a piping bag fitted with a medium nozzle. Pipe thumb-sized mounds onto the tray, spaced 4cm apart. Bake for 15 mins, until golden. After leaving to stand for 5 mins, transfer the biscuits to a wire rack. When completely cool, sandwich pairs of the biscuits together with a teaspoon of jam, dust with icing sugar, and serve. Zest and juice the lemons into a large bowl. With a small knife, cut away any segments left inside the skins and add to the juice. Reserve some mint for garnish, then chop the rest very finely. Add it to the bowl and season with the salt and pepper. Mix in the olive oil and honey, and chill. Arrange the sliced asparagus and radishes between six plates, then add the crab. Pour over the lemon and mint dressing, garnish, and serve. Combine the flour, sugar, mixed spice, currants, baking powder and salt in a mixing bowl. Add the butter cubes and rub into the dry ingredients with fingers and thumbs until integrated. Beat the egg in a small bowl and stir it into the flour and butter mixture. Gradually add sufficient milk to bring the mixture together by hand until it forms a dough. On a surface lightly dusted with flour, roll out the dough to 2cm deep. Cut out rounds with an 8cm cutter. Heat 1 tsp of butter in a frying pan. Fry the cakes for 4-6 mins, turning over once, until golden. Dust with sugar and serve warm with butter. Preheat the oven to 190°C/gas mark 5. In a large saucepan, melt the butter and mix in the flour. Heat, stirring, for 1 min. Stir in the white wine gradually, then the milk. Bring to a boil, stirring until smooth. Keeping on a simmer, add the brie to the pan, before seasoning with pepper and half of the nutmeg. Stir until the cheese has melted. Set aside. Pour a quarter of the cheese sauce into a large ovenproof dish and layer with a quarter of the bread. Pour over another quarter of the sauce, and layer with the bread, continuing until the layers reach the top of the dish. Grate the Cheddar over the top and sprinkle with the remaining nutmeg. Bake for 15-20 mins, until golden. Peel the onion and garlic and chop finely. Melt the butter in a pan. Fry the garlic and onion for 4min. Add the spinach and cover for a few minutes. Season with salt and nutmeg. Cover the baguette slices with cheese and bake in a preheated oven (225◦C/gas mark 7) for 5min. Chop the parsley finely. Divide the spinach among 4 small, round ovenproof dishes. Crack an egg into each and cook for 10min at 150◦C/gas mark 2. Season with salt and pepper. Sprinkle the baguettes with pepper and parsley and serve with the baked eggs. For back issues click here, or to subscribe to LandScape, click here. Grease 4 pudding basins and lids (100ml size) and sprinkle with sugar. Dry fry the almond flakes in a pan until golden brown. Leave to cool on a flat plate. Chop the cooking chocolate and melt in a dish over boiling water. Leave to cool for 10mins. Separate the eggs. Beat the egg yolks, butter and 15g sugar for 5mins until creamy. Stir in the liquid chocolate slowly. Beat the egg whites until stiff and add 20g sugar gradually. Mix together the breadcrumbs, ground and flaked almonds. Fold in the almond mixture, then the egg whites with the melted chocolate. Fill the pudding bowls with the chocolate mixture and seal tightly. Put the bowls into and ovenproof pan/bain-marie and place it on an oven wire tray. Fill the pan with hot water 2cm from the top. Cook in a preheated oven (electric 200c/gas mark 6) for an hour. In the meantime, mix the single egg yolk, 25g sugar, vanilla seeds and corn flour in a small bowl. Stir in the double cream and milk. Heat over a low heat, stirring constantly, then allow to cool a little. Remove the pudding covers and leave to cool for 10mins. Flip careful onto plates and serve with custard. To make the dough, sift the flour and spices into a large mixing bowl and stir in the yeast, sugar and salt. Rub in the butter, then stir in the currants and mixed peel. Beat the egg with a fork until broken up and frothy, then beat in the milk. Make a well in the centre of the flour mixture. Add the milk mixture and enough water to mix to a soft dough. Add the remaining water if needed. Turn out the dough and knead well for 5 mins, until smooth and elastic. Place in a lightly oiled bowl, turning to coat the dough in the oil. Cover and leave in a warm place to rise for 1½ hours until doubled in size. Turn out onto a lightly floured surface, lightly kneading again. Grease two baking sheets. Divide the dough into 12, rolling each piece into a ball. Place on the baking sheet and cover with a damp tea towel. Leave in a warm place until doubled in size. To make the cross, sift the flour into a bowl and stir in sufficient water to mix to a soft paste. Spoon the mixture into a piping bag and snip off the end. Pipe a cross on each bun. Bake the buns for 15 mins in a preheated oven at 220°C/gas mark 7. Meanwhile prepare the glaze. Place the sugar and water in a small pan and heat, gently stirring until the sugar dissolves. Once the buns are cooked transfer to a wire rack placed over a tray or baking sheet. Brush with the glaze while still hot. The buns are best eaten on the day they are made. They can be frozen for up to two months. Defrost in the refrigerator overnight and warm in the oven at 180°C/gas mark 4 for 5 mins. Place the chicken breasts between 2 sheets of baking parchment and flatten with a rolling pin. Season with salt and pepper. Peel the potatoes and cut into 2cm chunks. Cook in a pan of lightly salted boiling water for 15 mins until tender. Heat the oil in a heavy-based frying pan over a high heat and quickly brown the chicken on both sides. Remove from the pan. Reduce the heat and add half the butter to the pan. Toss the apple slices together with the sugar and the sage. Add to the pan and cook for 2 mins until the sugar begins to caramelize. Add the cider. Return the chicken to the pan. Reduce the heat and simmer for 10 mins, until the chicken is cooked through and the apple slices are tender. When the potatoes are tender, drain well and add the remaining butter. Mash well. Beat in the chives and keep warm. Remove the chicken from the pan and place on to warm serving plates with the apple slices on top. Return the pan to the stove and increase the heat. Stir in the double cream and boil rapidly until reduced slightly and pour over the chicken. Serve with the chive mash. The Queen of puddings traditionally combines custard, cake, jam and meringue. Our recipe makes it a little more seasonal with tangy rhubarb and ginger instead of the jam.